A wide range of supernatural creatures was known to inhabit Scotland. 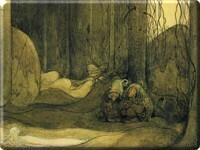 Sometimes terms such as fairy or trow are used interchangeably; in certain stories, a creature will be referred to as the former in one sentence, and the latter in the next. There are a few tales, however, in which the characteristics, behaviours, and appearances of these creatures differ from each other, although they all take some root in the Norwegian "draugr." More than a mere ghost or spirit, the draugr was one of the undead, residing outside his burial mound and free to wander the world of the living at will. Draugr stories mixed with indigenous stories about the mischievous, child-stealing spirits that dwelled inside the many hills of the islands, producing the archetypal trow. 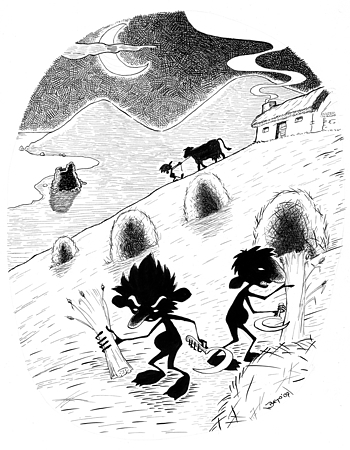 The trow is perhaps the most famous creature of Scottish folklore. Short, troll-like creatures, trows are both shy and mischievous. Their grotesque appearance is confirmed by some of the names ascribed to them, such as Trencher Face and Bannock Feet. Like the fairies, trows lived inside earthen mounds called trowie knowes, great magical halls adorned with gold, silver, and other precious metals. During the day, trows danced and made music while feasting on fine food and drink. They would only venture outside their dwellings in the evening, often sneaking into households as its inhabitants slept to indulge their habit of stealing newborn babies. The offspring of trows were thought to be weak, sickly little things. Because of this, the trows would go to great lengths to exchange their infants for healthy human children. Changeling folklore is widespread across Europe, rooted in a need to explain why certain children failed to develop normally. 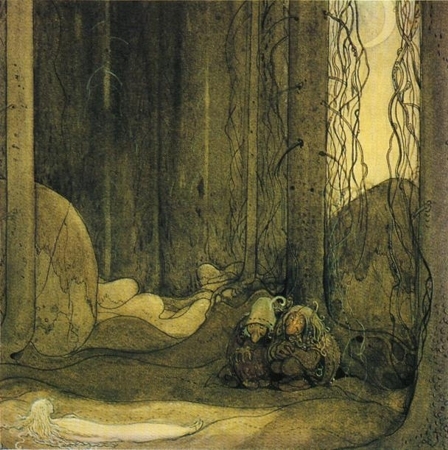 The parents of a child with a mental or physical abnormality could only assume that the child did not belong to them at all, but was instead a changeling: a creature begotten by some supernatural creature, such as a trow, an elf, or a fairy, and then secretly exchanged for the human child. Rather than mere fairy tales, changeling legends were often active superstitions: to families of old, a child born with what would today be diagnosed as autism, for example, was explained as a changeling. The changeling idea also prevented the parents from bonding with the malformed child, since it was assumed to be a creature of unnatural origin rather than their own offspring. Folklore sources suggest that such children often suffered serious physical abuse as the parents attempted to expose the child as a changeling according to popular rites. In most folk stories, the parents are rewarded for mistreating the changeling child, as the otherworldly parents frequently appear to rescue the changeling from abuse and return the stolen mortal child. Such wish-fulfillment endings served as optimistic sources of hope in an era plagued with birth defects and debilitating infant diseases. However, the stories are not always so happy. While the changeling child is usually driven away or killed, the original child is not always returned. The tales that omit the safe recovery of the rightful child authentically reflected painful aspects of life in pre-industrial Europe. The peasant family could rarely subsist without contribution from every member; a member who permanently consumed the family's resources rather than contributed to them made life more difficult for everyone. Changeling stories frequently highlight the changeling's ravenous appetite, an indication that the parents of the unfortunate child viewed its continuous existence as a threat to the sustenance of the rest of the family. More than serving to explain birth defects, changeling stories also justified the abuse and infanticide to which the child fell victim more often than not. In the past, changeling accounts teemed throughout towns and villages all over the British Isles. Infants were not the only ones who needed to be protected from trows, however. These creatures, unlike the fairies, also abducted adults, spiriting away the unfortunate mortals to their homes hidden deep within the earth. The most vulnerable people were new brides and grooms and pregnant women. The threat of being abducted by a trow was so great in Orkney, for instance, that its inhabitants developed elaborate folk rituals to protect brides, grooms, and expecting women from the malevolent little trows. Those who traveled the islands safeguarded themselves from wandering bands of trows by carrying metal knives with which they could scratch circles in the ground, for trows were powerless to cross a line drawn with a steel or iron blade. Famous for their love of fiddle music, trows were also known to lure musicians into their dens and trap them there. One common element in all the tales concerning fiddlers and trows is that the fiddlers, upon returning to the mortal realm, had no idea how much time had actually passed; often they believed they had only spent a day in the halls of the trows, when in actuality an entire year had gone by. Certain tunes played around the Scottish islands to this day are known as the "Fairy Reels," songs that trows supposedly taught to the fiddlers that visited their dens. As Christianity spread into the British Isles, folklore adapted to reflect the changing culture. The supernatural creatures of old took on more malevolent roles as the new religion pushed out pagan beliefs. 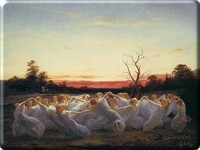 For example, the fairies of Scottish folklore are not the benign, gossamer-winged nymphs of popular tradition. Cast out of Heaven because they did not take part in the battle between Lucifer and Saint Michael the Archangel, the little creatures of Scottish legend became aggressive and quarrelsome on earth. When not bickering and fighting among themselves, the fairy folk caused destruction in the human world by attacking people and inflicting livestock with disease. A cow or sheep that fell ill was said to have been shot by a fairy's arrow, and the farmer would consult the local healer - a woman with all the supernatural powers of a witch but without any of the malevolence - for a remedy. Fairies were also known to steal mortal horses at times; these creatures would be found panting and fatigued the next morning in their stalls, their tails and manes disheveled and tangled. Sometimes the animal on which a fairy had ridden would become afflicted with a paralysis of the spine. A diminutive race of beautiful, lithe creatures, fairies inhabit the interiors of conical green hills, called fairy mounds. At night they dance on the hill under the light of the moon, leaving its surface marked with circles of matted, yellowed grass. Woe to the person who happened to fall asleep in a fairy mound! Travelers would take care to protect themselves with some sort of charm, or perform a ceremonial rite in order to avoid displeasing the fairies when crossing their dwellings. There is a spring on a mountain in Peeblesshire, for instance, called the Cheese Well. Passersby were advised to toss a piece of cheese in the well as an offering to the fairies, to who the well was consecrated, in order to avoid a curse. But not every creature lived to terrorize humans. The short, wild-looking Brownie had none of the grace or beauty of the fairy folk, but he was also much more benign than they were. In the daytime, Brownies lurked in the remote recesses of the old manors they inhabited, only coming out at night. While the family was asleep, Brownies busied themselves with any household chores or farm work that might be of benefit, performing such tasks with diligence and cheer. Not that they devoted their lives to the service of mortals for selfless reasons; Brownies remained instead devoted to the recompense of milk, honey, and porridge. So great was their attachment to this reward that if the laird or lady of the house failed even once to supply it, the Brownie would disappear to another house, never to return again. Sir Walter Scott's The Minstrelsy of the Scottish Border, a two-volume collection of folk stories and ballads, can be accessed online.